We’d love your help. Let us know what’s wrong with this preview of Encyclopedia of Language and Linguistics, 14-Volume Set by Keith Brown. The first edition of ELL (1993, Ron Asher, Editor) was hailed as "the field's standard reference work for a generation." 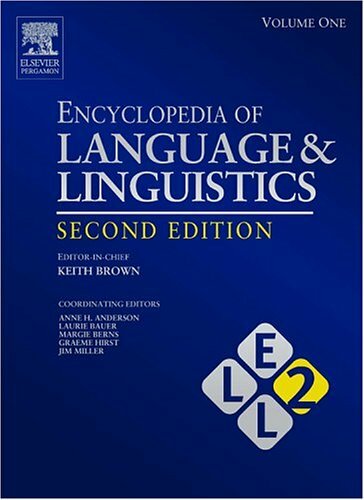 Now the all-new second edition matches ELL's comprehensiveness and high quality, expanded for a new generation, while being the first encyclopedia to really exploit the multimedia potential of linguistics. * The most authoritative, up-to-date, comprehens The first edition of ELL (1993, Ron Asher, Editor) was hailed as "the field's standard reference work for a generation." Now the all-new second edition matches ELL's comprehensiveness and high quality, expanded for a new generation, while being the first encyclopedia to really exploit the multimedia potential of linguistics. Also available online via ScienceDirect - featuring extensive browsing, searching, and internal cross-referencing between articles in the work, plus dynamic linking to journal articles and abstract databases, making navigation flexible and easy. For more information, pricing options and availability visit www.info.sciencedirect.com. 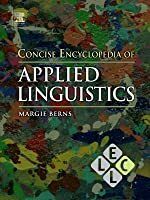 To ask other readers questions about Encyclopedia of Language and Linguistics, 14-Volume Set, please sign up. Superb set - the only reason why I'm not giving this 5 stars, is because of Elsevier Publishing's marketing practices. I understand that a set like this must cost a lot of money to compile and print; but honestly, $13 511.51 for the Kindle edition? A bit steep for an e-book set, wouldn't you say? ...or should we be blaming Amazon for that? Since I was lucky enough to pick it up second-hand for a paltry fraction of that price, I think I am going to buy myself a nice little used light pick-up truck Superb set - the only reason why I'm not giving this 5 stars, is because of Elsevier Publishing's marketing practices. I understand that a set like this must cost a lot of money to compile and print; but honestly, $13 511.51 for the Kindle edition? A bit steep for an e-book set, wouldn't you say? ...or should we be blaming Amazon for that? In my opinion, this is the best encyclopedia as to language and linguistics, written by quite a few distinguished professors and leading experts all over the world.